Cupid is one of the more identifiable symbols of love, and those with that special attraction and feeling for someone at times will decide to ink a cupid on their bodies to express that love. One nice thing about Cupid, as long as you don't foolishly include a name, is they will work with any person you're currently seeing, so if things don't work out, it is no problem to use it as a symbol of your current relationship. On the other hand, those you tattoo the name of someone they're unsure of, or if someone isn't that good in relationships, it's by far best to not ink a name on yourself, as most people will always regret it, as far as romance goes. Obviously parents or children are a different matter. As for Cupid tattoo designs themselves, most of them include the traditional Cherub look, with the arrow pointed at the heart of the intended recipient. Although I wouldn't recommend it, there are some couples who decide to have matching Cupid tattoos. Again, as long as you don't include a name, this is something that can be overcome if the relationship is ended. 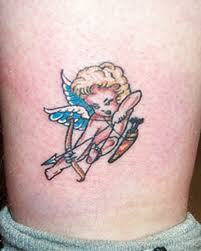 Most cupid tattoos are on the lighter side, but some people choose to have a more dark cupid design. Either way, as long as there is love there will be Cupid, and that means the love doctor will continue to be a part of tattoo art. I thought the tattoo of Cupid's bow and arrow was pretty unique. The inclusion of the heart as the arrowhead leaves nothing to the imagination as to what the purpose is. 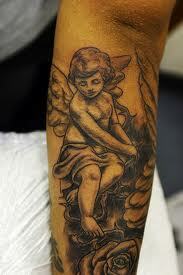 This Cupid tattoo of the minuscule Cherub about to let loose with an arrow is nice. Inking him on showing the back side is hilarious, as he unashamedly focuses on his next target. To show you how different Cupid tattoo designs can be, here's another one of Cupid about to release an arrow, and in this case he appears older than the one above. The quiver of love arrows adds a nice touch to the overall image. 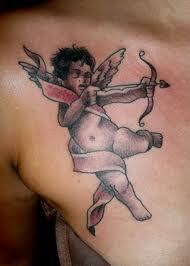 Here's an example of Cupid tattoos which have a couple of different things included. 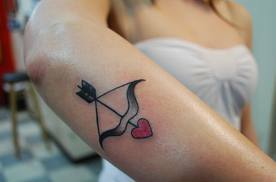 One, is the obvious matching couple tattoo thing, and secondly, the choice of a much darker Cupid. I'm not sure why someone would choose a Cupid like this to show their love for one another. But there it is. 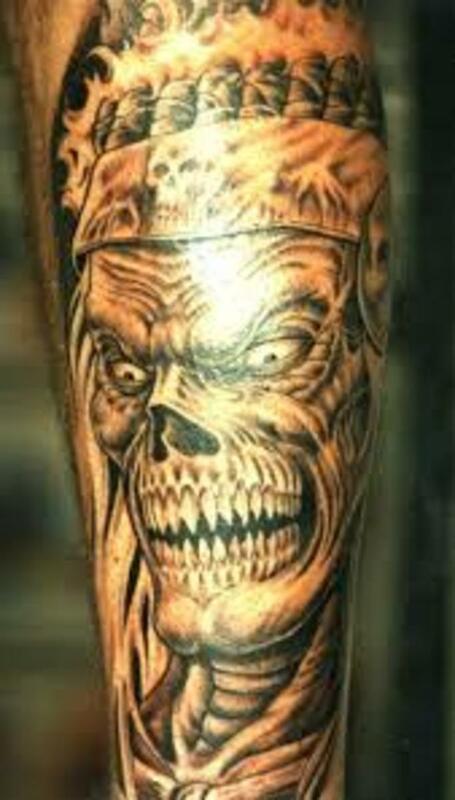 The tattoo designs themselves are outstanding, as far as quality goes. 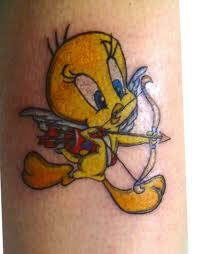 Having the lovable Tweety as Cupid is a really nice tattoo design. Who wouldn't like to have the wholesome character inked on them as a sign of their love? 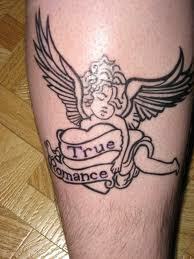 Although I'm not 100 percent sure this is a Cupid tattoo, mostly because of the lack of a bow and arrow, it does appear to show the little Cherub after the successful completion of a love match, as expressed by the phrase, "True Romance." This is a great way to express your love in a relationship, as the phrase can be applied throughout your life. 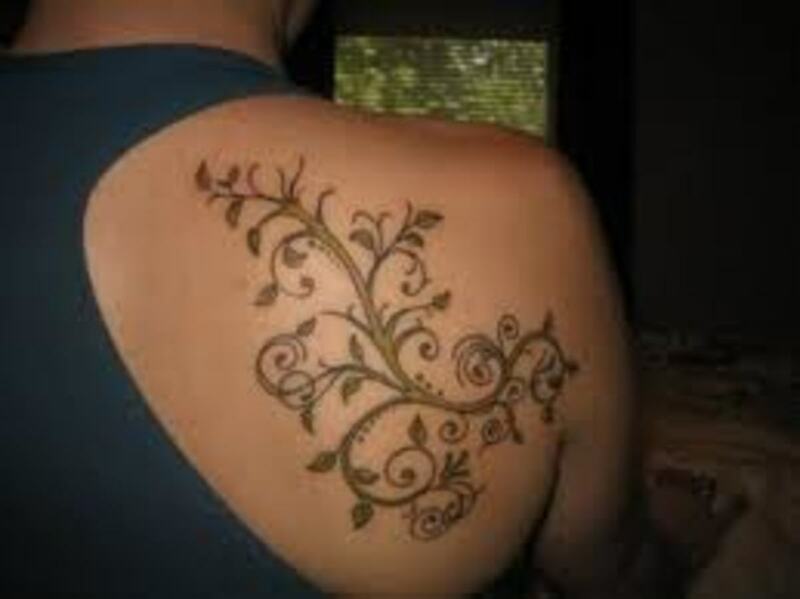 We look at a variety of couples tattoos in this article, including some nice designs and some of the things you must watch out for in relationship to matching tattoos and being a couple. 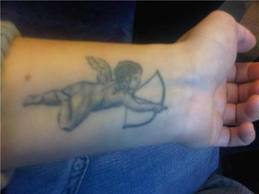 The Cupid tattoo below was interesting in that it didn't include the string on the bow, making me wonder if it was intentional. When you think of Cupid, he is a magical being, and the lack of string probably wouldn't keep the arrow from flying to the intended person. Cool conversation piece if nothing else. This Cupid tattoo apparently resting near a rose is a great design. It seems the work of the little Cherub is completed, and he is taking a well deserved rest. 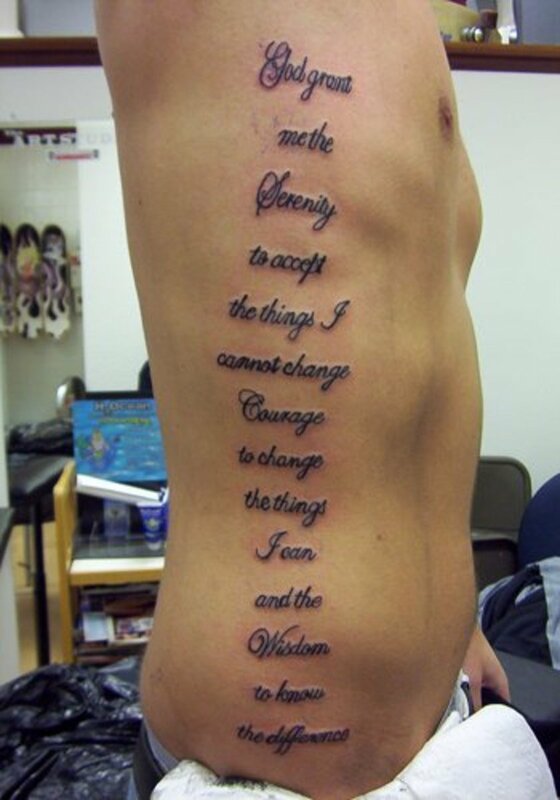 The lines of the tattoo are nicely done. Cupid and love go hand in hand, and neither will end as long as there are people on the earth. 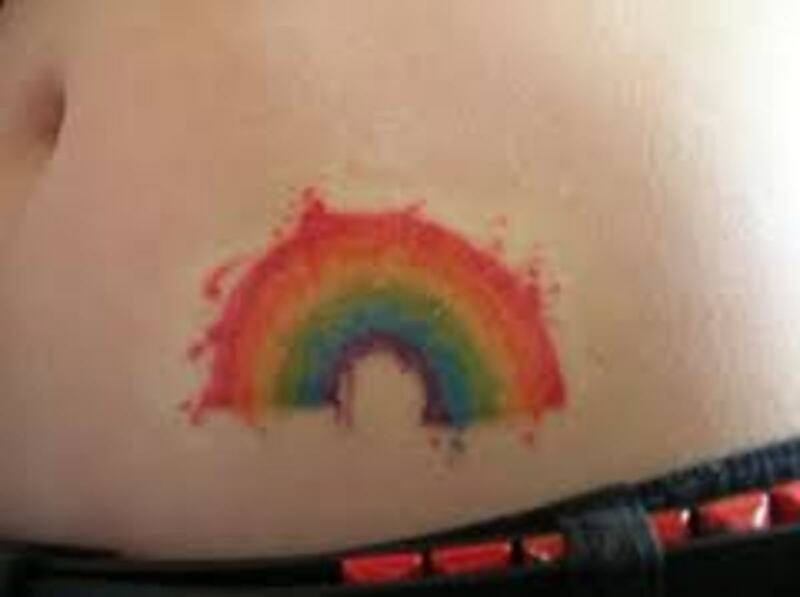 Expressing that love through a tattoo is a great way of revealing how you feel. 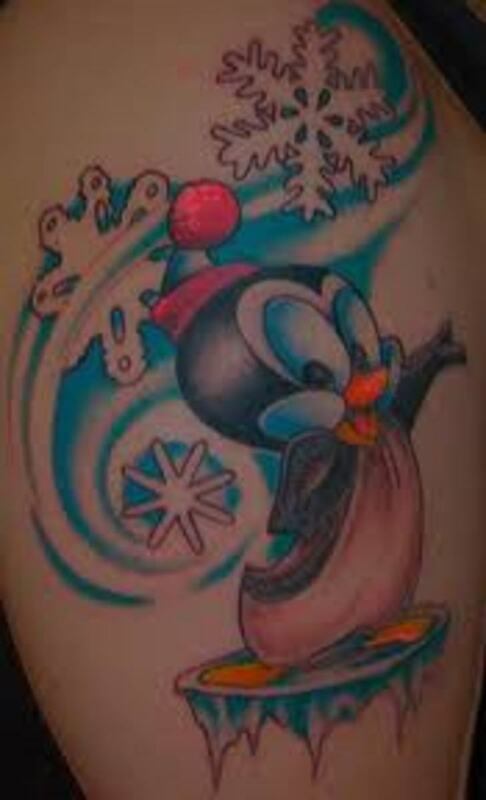 As with many other tattoos, as mentioned, avoid inking the name of someone on you if you at all can restrain yourself, as it's one of the major regrets most of those getting tattoos say they have. I like the variety of cupid tattoos you collected - so many variations. Good Hub!